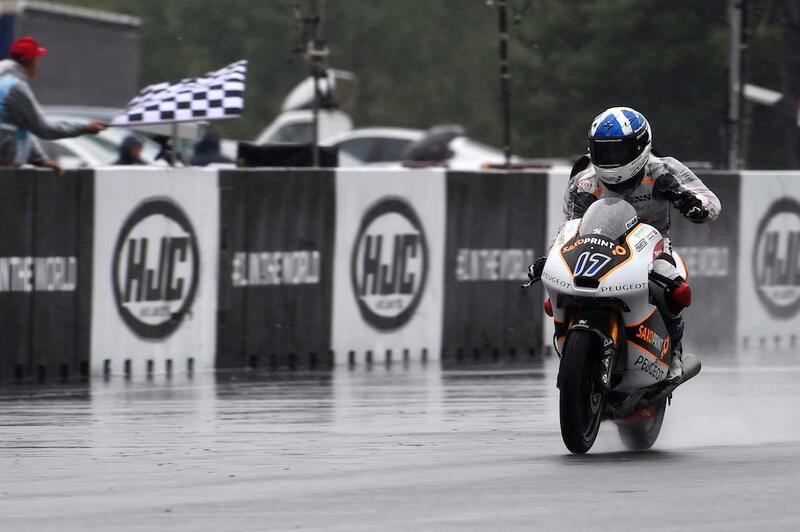 Scotland’s John McPhee took his maiden Grand Prix victory in the Moto3 class at Brno, making the most of his wet weather skills to produce an almost-flawless ride in treacherous conditions. 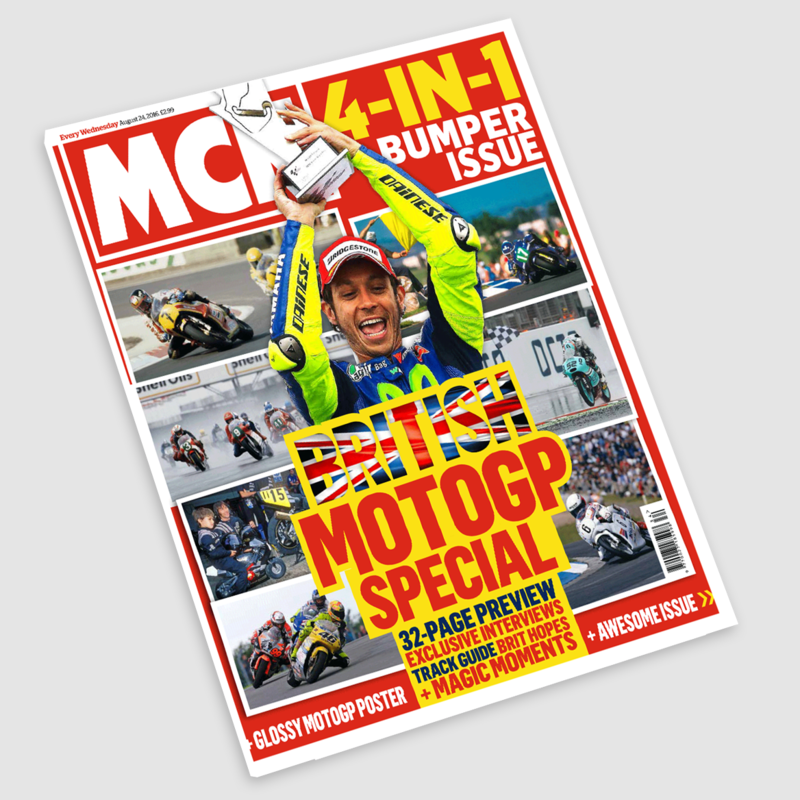 Championship leader Brad Binder took the lead in the early stages of the race, while McPhee made use of the more level playing field presented by the tricky conditions with his Peugeot Mahindra enjoying much less of a disadvantage to its KTM and Honda rivals. Settling in to a strong second place, the Scotsman looked set to take the runner-up spot to Binder until Red Bull KTM rider dramatically slipped out of the race with four laps to go. Taking the lead after Binder’s fall, McPhee was in a position to almost cruise home but with conditions so bad he couldn’t see his pit board and had no idea how far behind the chasing pack were. Pushing on in the closing stages he had a huge moment as he was flung from his machine before just managing to save it and take his debut win. That fortune wasn’t on the side of fellow wet weather specialist Khairul Idham Pawi, who made up an incredible 25 places to get on to the leading group before crashing out in the final stages of the race. 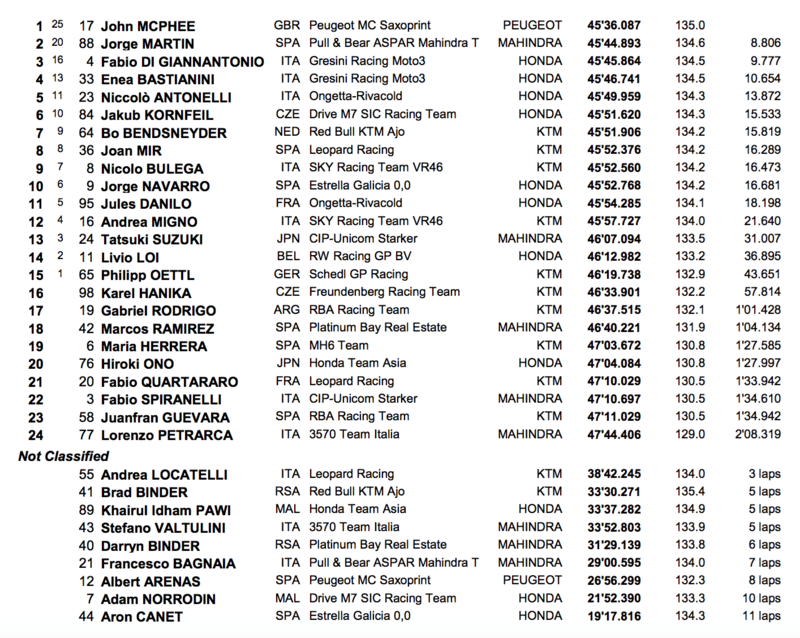 Jorge Martin made it a 1-2 for Mahindra with second place for the Pull & Bear Aspar squad, with Fabio Di Giannantonio third for Gresini Racing.